The joints and muscles of the ankle and foot need to be maintained properly. Nerves provide the ankle and foot with sensation and also tell the muscles when to contract and when to relax. The ankle and foot require nerve supply to function properly. Here’s a look at the nerves that keep the foot and ankle kicking. Tibial nerve: This nerve is a branch of the sciatic nerve. It runs down the leg, between the heads of the gastrocnemius, and passes under the soleus. It curves under the medial malleolus and continues into the foot. It innervates all the muscles in the posterior compartment of the leg. Common fibular (peroneal) nerve: This nerve branches off the sciatic nerve in the popliteal region (behind the knee). It travels posterior to the head of the fibula to enter the lateral compartment of the leg deep to the fibularis longus. Here it divides into the superficial and deep fibular nerves. The superficial fibular (peroneal) nerve runs through the lateral compartment of the leg and innervates the muscles in the lateral compartment and the skin over the anterior portion of the ankle and the dorsum of the foot. The deep fibular (peroneal) nerve runs through extensor digitorum longus and down the interosseous membrane. Then it crosses the tibia and enters the dorsum of the foot. It innervates the muscles in the anterior compartment of the leg and the dorsum of the foot. It also supplies a small region of skin between the first (big) and second toes. Sural nerve: This nerve (formed by the union of branches from both tibial and common fibular nerve) also runs between the heads of the gastrocnemius, but it runs under the lateral malleolus. It innervates the skin on the lateral side of the leg and foot. Saphenous nerve: This nerve is a branch of the femoral nerve and runs down the medial portion of the leg to the medial part of the foot and innervates the skin on the medial side of the ankle and foot. Medial plantar nerve: This branch of the tibial nerve runs between the abductor hallucis and flexor digitorum brevis in the foot. It innervates the skin of the medial side of the sole of the foot, and it’s the nerve supply for the some of the foot muscles. Lateral plantar nerve: This nerve, also a branch of the tibial nerve, runs between the quadratus plantae and flexor digitorum brevis. It innervates the skin on the lateral part of the sole and several small muscles of the foot. 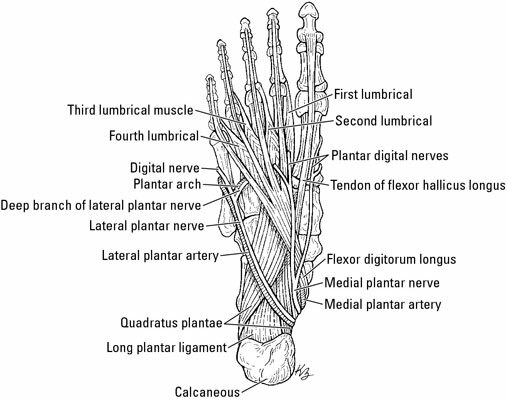 Plantar digital nerves: These nerves branch off the medial and lateral planter nerves. They innervate the skin and nail beds of the toes.